Hello all you Julia Roberts fans! Welcome to the April 13th edition of Tuesday Couch Potatoes, where we post about a movie each week. Pardon my late entry... both Hubby and Samantha are sick so I had to take care of my two babies first before I hit the keyboards. Anyway, I know you are all waiting for the MckLinky and I am just as excited as you when it comes to this week's theme: Julia Roberts Movies. If you are a fan, why not share a movie starring Julia Roberts with us? My pick for this week: The Pelican Brief. This 1993 legal crime thriller was based on the novel of the same title written by bestselling author John Grisham. I was in high school when I first watched this film. I was largely influenced by my friends who are also big John Grisham fans. At that time, I thought that it has a rather complicated plot with lots of characters coming in and out (getting killed) so that it could get confusing. I do remember that Darby was running for her life in this movie, and was very lucky to have escaped death, thanks to her quick thinking... and that Denzel Washington who played the role of reporter Gray Grantham was very good. Here, Julia Roberts plays the role of Darby Shaw, a Law student who wrote a theory on the separate assassinations of two Supreme Court justices. While doing her research, she discovered that the assassinations are related and that it is politically motivated. In her pursuit to get the truth out, her life and the lives of those who got their hands on the Pelican Brief were also placed in jeopardy. In the end, truth has prevailed but at the cost of many lives. Got a Julia Roberts movie to share? Come share it with us this week. Please be informed that MckLinky will be open until Friday, April 16th so if you are running late, you can still post your TCP entry and add your TCP link URL. Be sure to enter the link URL to your TCP entry so others can come and visit you too! Thank you for joining us this week on Tuesday Couch Potatoes couchers. Next week, get ready for your Favorite Year 2000 movie. Till next Tuesday everyone, take care and Happy TCP! this is one of Julia Roberts' best movies. co-starred with Denzel Washington in a John Grisham novel, definitely a hit. mine is up now. 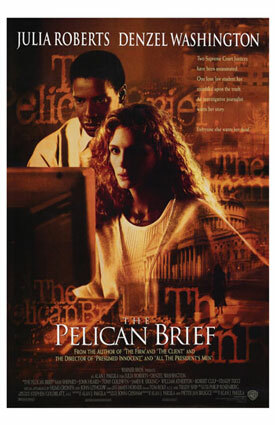 I have never watched The Pelican Brief. Thanks for the synopsis. It looks like I'm more determined to find the DVD now. I love The Pelican Brief..
mommy kamz.. namiss na kita! waah!!! pati TCP... gusto ko sumali ngayon, kaso naman, wala pa pala akong napapanood na movie nu julia.. ano ba!!! sharon lang talaga ako.. wahaha!!! i'd seen this one after i read the book. it was great! Great pick mami kamz, this is a great movie to watch. I love this movie Mare.Naunahan mo ako hehe actually I have a copy of DVD in my home hehe.I just love Julia Roberts & 'm so glad this is the theme for this week,my fave! My post is up for the BC Bloggers' Party now it's your turn. Warning: it's about me, me, and me. Read at your own risk! Loved that movie... Julia is one of my favorite actors.